Mimi Munro "2007 Woman of the Year"
It’s no secret that the state of Florida has produced tremendous female talent with the likes of four-time World Champions Frieda Zamba and Lisa Anderson. But before these North Florida standouts could even stand up on a board, came Mimi Munro. Munro was born in Daytona Beach, Florida in 1952 and began surfing in Anderson’s hometown of Ormond Beach at age 10. 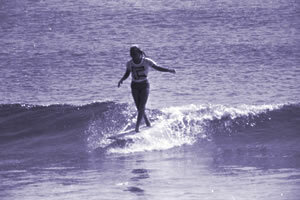 She was 1964 Florida State Champion at age 12 and in 1965 and 1966 won the East Coast Surfing Championships. 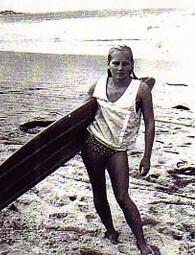 As the first East Coaster to surf in an international competition, Munro took third in the 1966 World Surfing Championships at a mere 14-years-old. It wasn’t until age 40 that Munro began dreaming of surfing again and picked up a longboard. In 1996, Munro was inducted into the East Coast Surfing Hall of Fame. At age 49, she won the women’s pro longboard division at the Cocoa Beach Easter Surfing Festival. Murno still competes and has won such notable East Coast events such as the 2003 Betty Series Finals in Florida and the 10th Annual East Coast Wahines Championships in North Carolina in 2006. She continues to influence young women surfers by teaching at surf camps in Florida. PHOTO: Mimi at home on the East Coast shows classic longboard style of the ’60s with the forgotten art of the cross-step. PHOTO: As a 14 year old, Mimi – shown here coming out of the water – finished third in the World Championships in San Diego behind inaugural Woman of the Year inductee Joyce Hoffman.